Why: The 16th Anniversary of sjDANCEco is entitled Flying and will feature a collaboration with the San Jose Chamber Orchestra under the direction of Barbara Day Turner. More: The 2018-19 Fall Season entitled Flying returns the company to the beautiful California Theatre with two public performances, and again this year a free Youth Performance for under-served Title 1 schools. In its 9th year of collaboration with Barbara Day Turner and the San José Chamber Orchestra, the program will feature the Company Premieres of “Corvidae” by Limón Dance Company Artistic Director Colin Connor and “Flying Colors” by sjDANCEco’s Choreographic Advisor/Mentor Fred Mathews. The Program will also include World Premieres by company choreographers Maria Basile and Gabriel Mata as well as excerpts from José Limón “Mazurkas” which premiered in 2014. Saturday night's VIP tickets include entry into our aftershow Gala, with a chance to meet the dancers and choreographers of sjDANCEco. Artistic Director, Maria Basile, confronts ‘Parallel Universes’ with her World Premiere for sjDANCEco’s 16th Anniversary Fall Season. An abstract story about two people who have one foot in each reality creating a dynamic field between them. With two working titles…htaPReset or htaPParallel, the work is danced to contemporary composer, David Crowell’s Open Road – played live by the San Jose Chamber Orchestra. Gabriel Mata, a company member since 2012, is a dedicated risk-taking choreographer who has been winning accolades across the country. Chosen at last year’s Minnesota Fringe Festival by the Twin Cities Arts Reader as “Best of the Fringe” and this year the “Audience Pick”, his current solo work Dreaming will be a Company Premiere. Reviewer Tim Wick wrote about this year’s sold out Fringe performances: "What I love about Gabriel Mata is his understanding of the ways dance doesn’t always succeed. At it’s worst, dance can be aloof and impersonal. The audience seems almost like an interloper – there to watch but not to interact. Mata breaks down the walls between audience and dancer. He joins them together in an experience that neither could have without the other. This is what binds together all good theater – an interaction between the audience and the performer. When that bridge is not built, the audience is left wondering why they are even there. Mata has a deep respect for what the audience brings to the equation. He wants us to appreciate his work for the story it tells and he takes the time to help us understand the story though movement but also, sometimes, through words. His stories may come from him but he wants to give them to his audience. More than most, he knows how to make that connection." Gabriel will also present the World Premiere of In This Time which addresses the heteronormativity that is imposed on lgbtq dancers, their personal dreams, and aspirations. Set to Franz Liszt’s - Benedictus und Offertorium aus der ungarischer Krönungsmesse the work explores the idea of what a "perfect dance" would be for the performers, how they would like to perform the work, what roles they would like to take on and the kind of movement quality they would like to dance. Taking the choreography into their own hands, they begin to reset it while discussing their personal views on normalized gender roles. Choreographic Advisor/Mentor Fred Mathews’ Flying Colors was originally commissioned by Winnipeg’s Contemporary Dancers and had it Premiere in 1978. It was a signature work of the Mathews – Masters Dance Company/New York, was the highlight of the company’s tour in France in the 1980’s and has been staged for professional and university Dance companies. Set to JS Bach’s Violin Concerto #2, the work has been staged for nine sjDANCEco dancers with Artistic Director Maria Basile in the Solo role. Hsiang-Hsiu Lin, one of the founding sjDANCEco dancers that is still with sjDANCEco today! He is the Director of Lin HH Dance Company of Taipei. The 16th Anniversary Season entitled Flying will again be in collaboration with the San José Chamber Orchestra under the Direction of Barbara Day Turner. 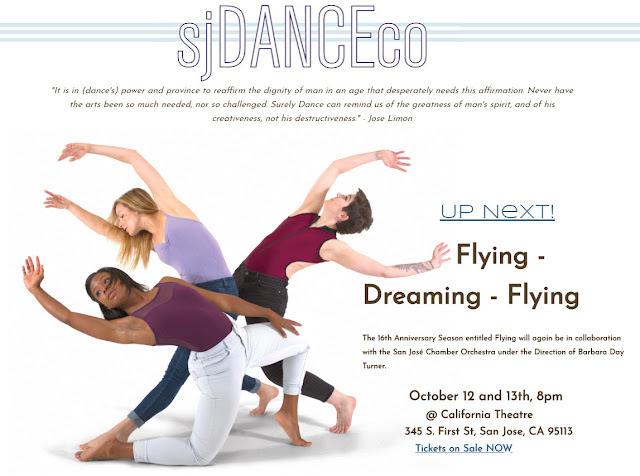 sjDANCEco is a year-round contemporary dance company based in San Jose, California that produces world premieres by its core and guest choreographers, and presents the very best of Contemporary and Classic Modern Dance and Masterpieces of the American Modern Dance Repertory. In addition to a full season of dance concerts, sjDANCEco also is a major participant each Spring in free outdoor dance presentations during National Dance Week, international dance festivals, and has a full schedule of contemporary dance classes for the advanced and professional dancer. sjDANCEco ignites the spirit of dance.